As with any industry, the pet services industry is constantly evolving to keep up with client demand. In hair salons for humans, hair styles and treatments go in and out of fashion. The same applies to the pet grooming industry. In fact, there are some cases where the grooming trends for our furry friends mimic those of their owners. Here are three trends popping up this year in the world of pet grooming. According to Rover, temporary ‘tats’ for dogs are currently in style. These ‘tats’ aren’t tattoos so much as they are designs that are shaved into the fur when a dog is being groomed. The trend of cutting designs into human hair has been done for years but now it is now finally making its first interspecies appearance. Common tats include paw prints, hearts, and logos of favorite sports teams. Take time to train your staff in how to make these fun shapes. Accessories for animals is growing trend that pet groomers can capitalize on. Puppy Lover News explains that accessories are used in a variety of ways for our furry friends. From a practical GPS collar for a pooch who wanders to a saddle for a dog that has been groomed to look like a horse, the sky is the limit when it comes to adding frills to a dog’s look. Your pet grooming business might want to invest in retail. 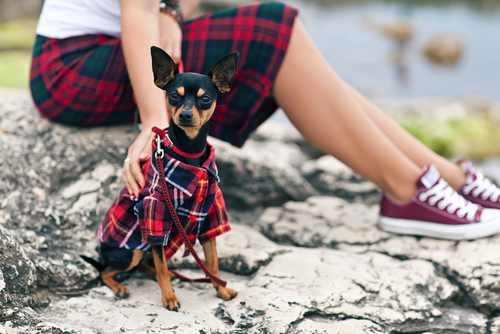 An owner may want to pair their pup’s new haircut with a fun new collar or jacket. People Magazine brings Geometric Shapes, a Taiwanese grooming trend, to our attention. According to People, Taiwan is a country that is on the forefront of pet care trends. The latest trend is cutting dog’s hair into a perfect geometric shape. Circles and squares seem to be the most popular cut for these Taiwanese pups. There is obviously a great deal of precision used in giving these special geometric cuts to dogs, so make sure that your staff has a steady hand and has practiced this new trend. These trends may be something to add to your list of services. Remember that trends are always changing and your list of services should be as well, not only on your website but also across the web. Learn more about how SinglePlatform can help your business stand out everywhere that matters online.